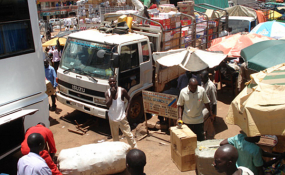 Ugandan vehicles loaded with goods en route to Sudan. Cape Town — A high-profile international commission which advocates for Africa has criticized the "glacial" progress of talks on world trade reform that would enable the continent to take more responsibility for its own development. At the same time, it is calling for a massive increase in arable land to be put under irrigation, and for billions of dollars in additional foreign aid. The Commission for Africa, established by former British Prime Minister Tony Blair, issued a follow-up to its landmark 2005 report on Monday, ahead of the United Nations Millennium Development Summit to be held in New York later this month. The commission comprises figures ranging from former Tanzanian president Benjamin Mkapa and Ethiopian Prime Minister Meles Zenawi to former U.S. senator Nancy Kassebaum Baker and ex-British cabinet ministers Tony Benn and Gordon Brown. The commission says Africa has made "extraordinary progress" since it issued its 2005 report. "From 2003 to 2008, the continent sustained average annual growth rates of six percent. Foreign investment and exports quadrupled. This was largely driven by African governments' efforts to make it easier to do business in their countries, supported by increased African and international investment in infrastructure - as well as record levels of demand for African goods." The demand for natural resources, especially from emerging economies, have "transformed" Africa's relations with the outside world, the report adds. It says debt relief totalling U.S. $100 billion and a 46 percent increase in foreign aid since 2004 has helped boost government spending on health, education and other social services. "Governance has improved in many countries, and though some existing conflicts remain intractable, there have been no major new conflicts on the continent." But the progress has not been enough to put Africa on course to meet the Millennium Development Goals (MDGs): "Sub-Saharan Africa as a whole will not achieve any of the MDGs on time and the vast majority of Africans have yet to benefit from the economic success of recent years. "Economic growth and trade have been damaged by the global economic crisis. Climate change and rising food prices will make poverty reduction more challenging in many parts of the continent." Identifying the biggest obstacles to development, the commission says "international trade reform is perhaps the area of least progress," and goes on to label the World Trade Organization's Doha round of talks as "woeful" and "glacial". Turning to African governments, the commission says they "have not done enough to speed up their own investment in rural infrastructure and have failed to fulfill their commitment to spend at least 10 percent of their budgets on agriculture." It notes that it called in 2005 for arable land under irrigation to be increased by 50 percent by 2010: "Only six percent of land in Africa is irrigated and between 2004 and 2007 the amount of land equipped for irrigation increased by just 0.9%." It also says investment in higher and technical education has not increased, contributing to a continuing shortage of trained teachers, doctors and other key professionals. The commission says the total aid needed to achieve the MDGs is estimated at around $120 billion a year between 2010 and 2020, including $10 to 20 billion a year in additional support to adapt to climate change.